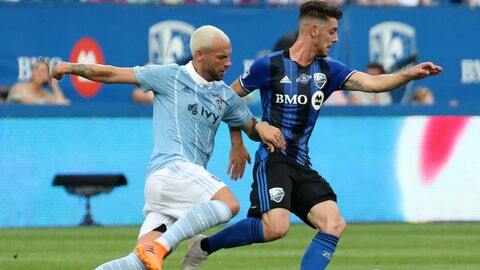 Sporting Kansas City falls 2-0 to Montreal Impact Saturday night. MONTREAL — Ignacio Piatti and Alejandro Silva scored in the second half as the Montreal Impact beat Sporting Kansas City 2-0 on Saturday night in hot and muggy conditions to end the American club’s nine-game unbeaten streak. The Impact (7-11) handed Western Conference-leading Sporting (9-3-5) its first loss since April 28. Kansas City’s unbeaten run included two wins in U.S. Open Cup play. Montreal has won three straight and four of five — with shutouts in all four victories. Piatti scored his ninth goal of the season and his fourth in the last three matches in the 54th minute. Silva added his first MLS goal from the penalty spot in the 70th. Water breaks were called to keep players hydrated.